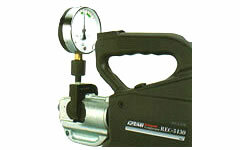 PG-610A Pressure Test Gauges: Izumi Products. The PG-610A test gauge was designed to measure output force up to 15 ton. It is used to calibrate 12 ton and 15 ton tools. It was designed to fit in all brand 12 ton tools and is supplied with U type test dies. When 15 ton tool EP-610HS2, is calibrated, U die adapter is necessary to adapt test dies. The PG-610A comes complete with U type test dies and steel carrying case. Dial face up to 18 metric ton.